No, the Rocket Men slot is not about space exploration, nor is it a slot expressly designed by the White House to poke fun at the leader of North Korea. It is rather about nuclear Armageddon and treats the subject in quite comedic light. The stars here are unsurprisingly Donald Trump and Kim Jong Un and there are five reels and twenty paylines to explore. Bets range from 20p to £500 and the gameplay is supported on both mobile devices and the PC. 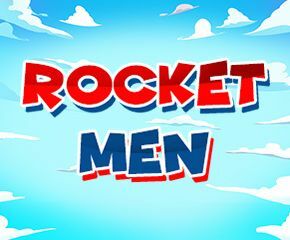 Want to know all about the Rocket Men slot? Then read on, comrade! 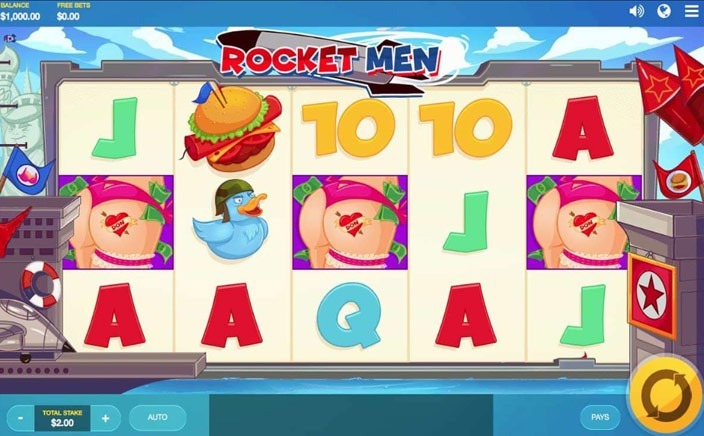 The Rocket Men slot could have been designed by a comedian with a wacky sense of humour, has cartoonish visuals and apart from the low-value playing card icons sports such oddities as a juicy burger that’s filled with dynamite, a row of ducks in army helmets, and the booty of a lap dancer. Don’s Driving Range: This feature is activated by landing a Trump symbol and makes possible a new payout. The way it works, Trump is shown atop his tower, hitting golf balls everywhere on the reels. The losing symbols on which the balls lands become winners and a payout are then made. Kim’s little game: This feature is activated by landing a Kim icon. Kim then makes an appearance at the top of his tower and fires his missiles on the reels in order to turn them wild. As well, like the feature above, a new payout is made, and the extra wilds are kept in position. Boom Time Feature: Here, Kim will fire a missile on a target. The cash bonus players receive will vary depending on where the missile impacts. Party Time feature: This results in Trump spanking a few bottoms. Each spanked bum shows a cash reward. Nuclear Spins Feature: This feature gives players a limitless amount of free spins. Both of the featured antagonists will fire wild rockets on the reels. The free spins mode then continues until one or the other is the victor. Rocket Men is as much fun as being tickled by a panda! It’s a medium to high variance slot, with wins of up to 1000x possible. If you are on the lookout for a slot that’s absurdly funny, imaginative and rewarding, then this just might be for you.